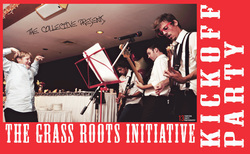 The Grass Roots cultural initiative is proposed model for economic and cultural cooperation. It gives artists and cultural agents access to temporary space, and financially benefits property owners and developers showcasing their buildings. The grass roots initiative would allow spaces that are currently vacant or idle within our community, (storefronts, warehouses or other buildings) to be used for art exhibitions or cultural events that are temporary, short-term or one time. Projects can include a wide variety of forms including performance, slam poetry and spoken word, traditional visual arts, non traditional and craft oriented works, installations and multi-media projects. 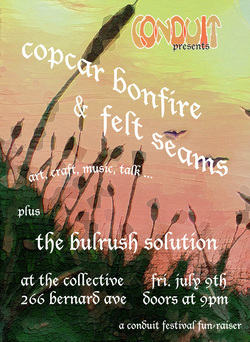 Pilot projects have included a pair of 2 week group exhibitions by local artist with opening receptions/concerts in the summer of 2010: The Grass Roots initiative Kick of Party and the Bullrush Solution, a collaboratively curated exhibition and community fundraiser with local artist and inventor Gabe Cipes. These exhibitions were both held at the former Collective Realty location downtown Kelowna in the summer of 2010. Shortly afterwards an agreement was made to use the unused building at 1476 Pandosy for the self curated project Discust(t)? : conversations on the male body. Creating accessible venues for young and emerging artists opens up another dimension to the Okanagan Art scene that allows for temporary, non sale-able and challenging artworks that are in many cases, unable to be shown elsewhere in the Okanagan. This relationship is beneficial to both the cultural community and the local real estate economy.The GRI is able to inject cultural activity, energy, publicity and community interest into buildings and areas of town that otherwise remain stagnant and derelict. -In 2000-2001,the old laurel building hosted one of the original Cake Walk Arts Festivals. By 2002 the building was renovated and turned into what is now the Rotary Centre for the Arts. -In 2004, a run-down building at 248 Leon Avenue was the site of one of the Dutone Arts festivals. Shortly afterwards it too was sold and is now the Habitat. -After another Duotone festival, this time held at the old CN Train station in 2006, the festival acquired the interest of buyers, and the building is currently being developed into a restaurant. The Grass Roots Initiative is grateful to the architects who came before us and set this culture in motion with events like CakeWalk, DuoTone and Conduit, as well the unknown others who came before them. Definatley the most important tool to hit the Okanagan Art community in recent years. Its a free email list serve and Blog run by Artist Katie Brennan. (she's doing this without being paid!) Being in the know is indispensable for any artist or art art organization in the Okanagan. Professor Bernard Momer publisheshed a recent study which shows how the Arts Community here in Kelowna contributes a very tangible $144 M into our local economy annually. A Good reason to make sure that local culture gets active!